Pride and joy The study by NALP and NAR shows landscape installation projects bring homeowners the most joy, compared to other outdoor projects. Landscape installation projects rank among the highest in terms of outdoor projects that bring homeowners joy, according to a study by the National Association of Landscape Professionals (NALP) and the National Association of Realtors. The two associations partnered to analyze outdoor residential and commercial projects, why property owners should invest in them and the value these projects bring people—both financially and emotionally. The “2018 Remodeling Impact Report: Outdoor Features” took a multipronged approach to the research, surveying more than 4,000 consumers on homeownership site HouseLogic.com about the last outdoor project they undertook; more than 400 NALP members about average project costs; and nearly 7,000 members of the National Association of Realtors about the cost recovery for each project. 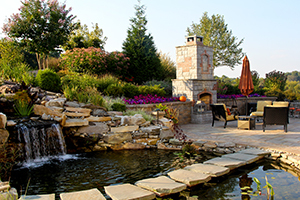 When it comes to the enjoyment homeowners gain from these projects, a fire feature and irrigation system tied for first, both receiving a perfect Joy Score of 10. Joy Scores range between 1 and 10; higher figures indicate greater joy from the project. The next most appealing projects were a new wood deck (Joy Score of 9.8), a water feature (9.8), statement landscaping (9.7), a new patio (9.7), landscape lighting (9.6) and an overall landscape upgrade (9.6).